A bedroom is so much more than just a place for sleeping, it’s a refuge from the outside world. It’s a space to escape the madness and simply kick back and relax. As such, the way that you design your bedroom is of great importance. Not only should it suit your personal taste and flow on from the rest of your house, but it also must offer serenity and a little bit of luxury. 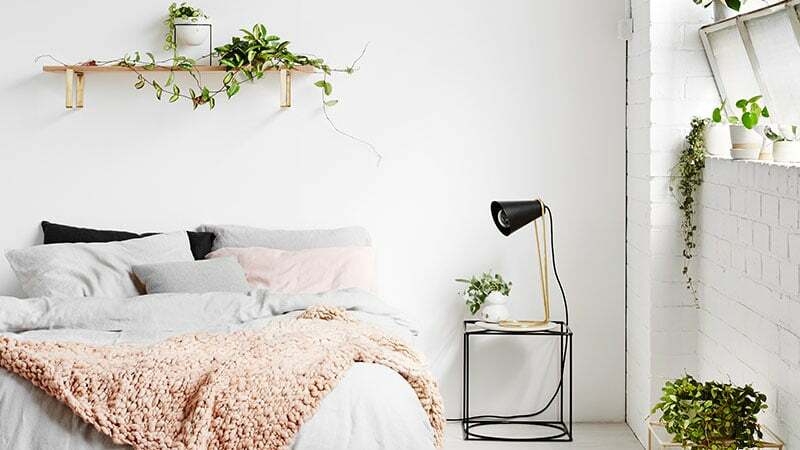 From the bed and the colour of the walls down to lamps and decorative accessories, every element of your bedroom is essential to creating your own little paradise. 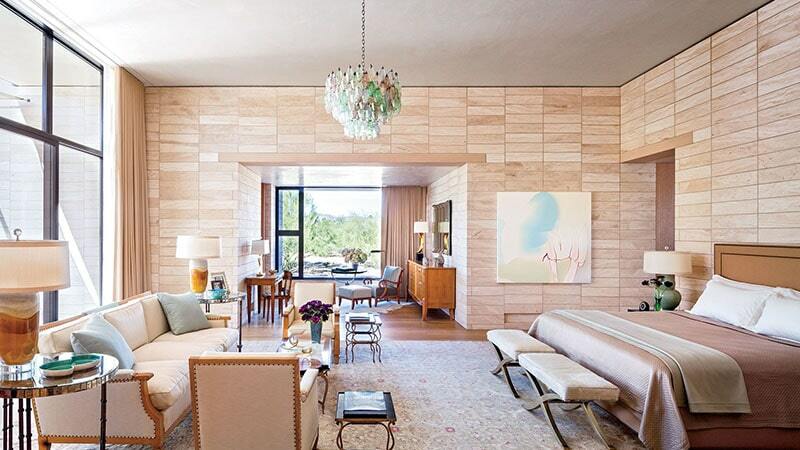 Modern luxury meets rustic design in this inspirational room. 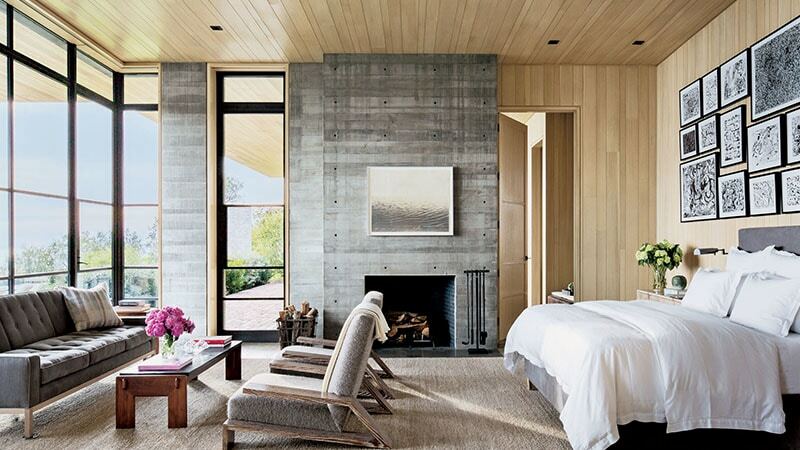 Incorporate its style into your own bedroom by mixing materials such as silver metal and wood or cashmere and brick. 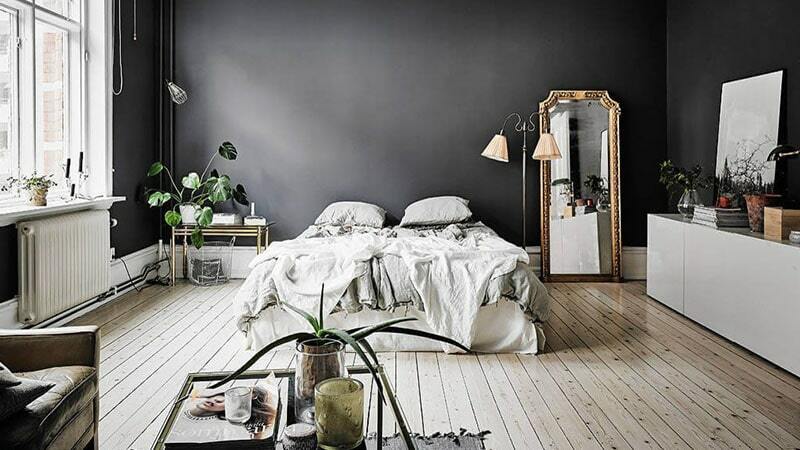 This light-floored bedroom is turned into the perfect space for sleeping with the addition of charcoal walls. In this bedroom, washed-out blue is paired with white and grey for the ultimate serenity space. Cool colours, such as these, have a lovely calming effect while warm tones offer the feeling of comfort. Pops of yellow add a sense of happiness to this otherwise neutral room. If you have a bedroom that’s looking a little dull, try adding your own small pops of colour to brighten it up. Vintage touches add charm and character to this stylish room. 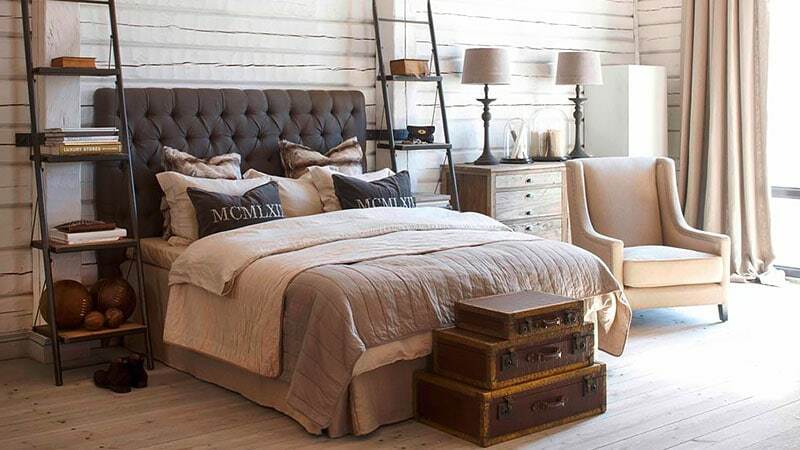 The trunks stacked at the foot of the bed are a particularly chic touch that you can easily incorporate into your own bedroom. 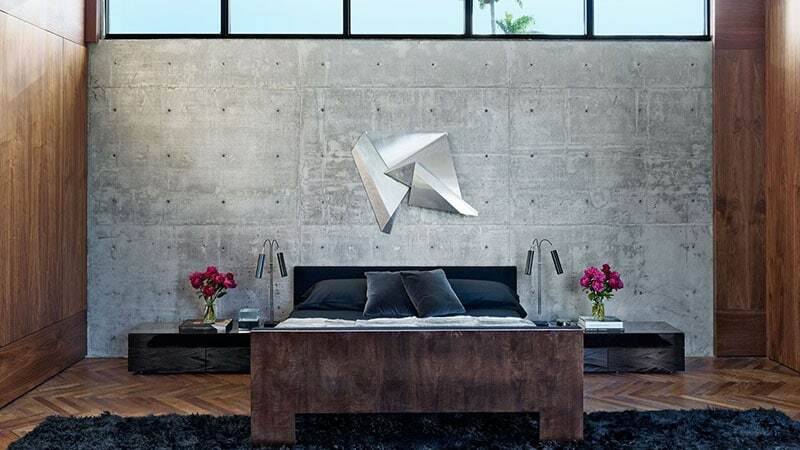 By opting for a sculpture over regular artwork, you can create a room that’s stylishly modern and sleek. Just be sure to let the unique feature become the focal point of your room to avoid clashes. 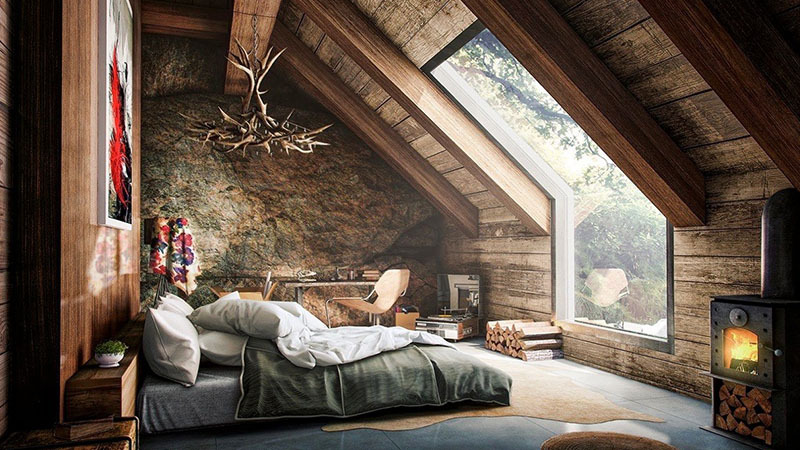 By creating a bedroom with numerous wooden elements, you’ll infuse it with a rustic and masculine appeal. Just remember to make the ambience a little cosier with the addition of some softer textures. Light pink walls can make a lovely alternative to standard white and beige options. In this room, the hue is turned into a neutral with the addition of white trimmings and bolder accent colours. Who needs a bed when a simple mattress on the floor can look so stylish? Coupled with two large, low-hanging, pendant lights, the look appears chic and purposeful rather than shabby or cheap. 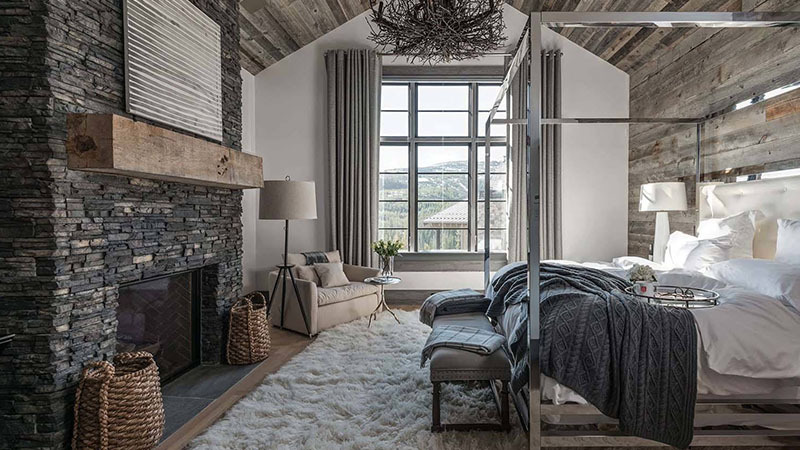 Multiple shades of grey give this bedroom a moody yet sleek appearance while the simple addition of plant life and a log-stacked fireplace keep it from looking cold. Sometimes there’s nothing more relaxing than clean, clear, and minimal design. Just be sure to add at least some interest in the form of texture or colour. 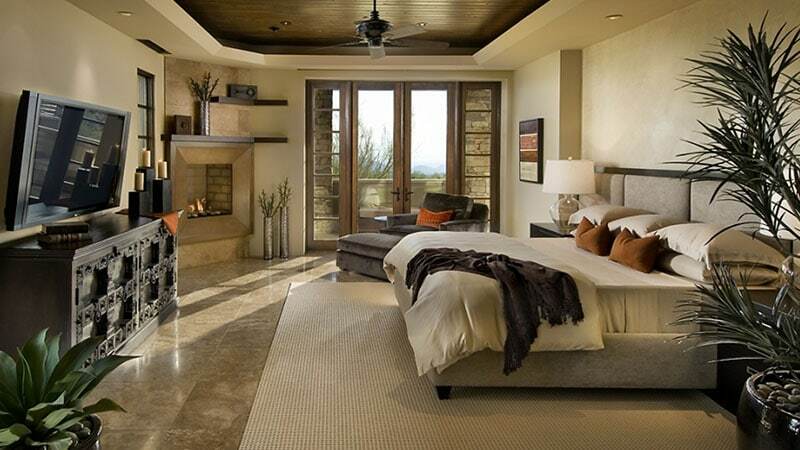 This stylish bedroom is perfect for the modern-day gent. 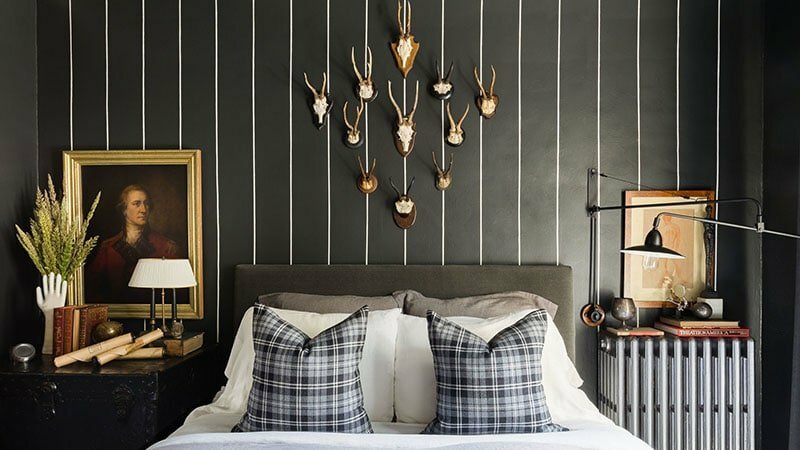 Utilising a dark colour palette and mixing in rustic and vintage details, it quickly becomes a sophisticated, masculine retreat from the rest of the world. 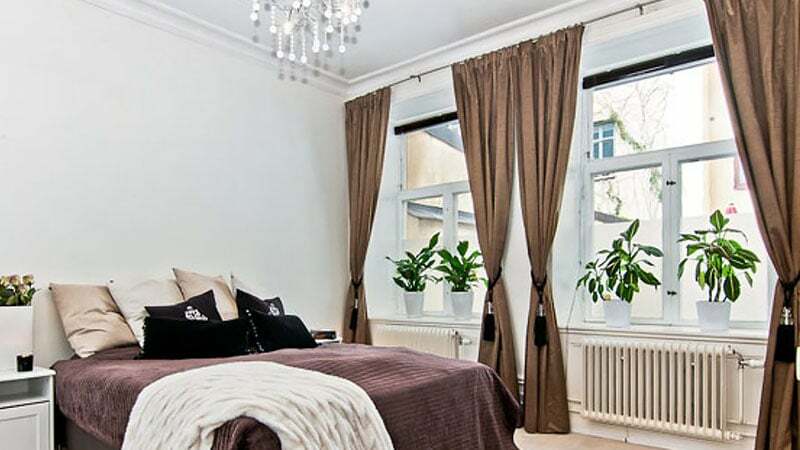 Plain, white bed linen can help create the perfect space for relaxing and clearing your mind. It also allows you to be more creative with the other pieces you add to the room. By choosing matching bedside tables and lamps, you’ll help to create a polished and calming symmetry to your bedroom. 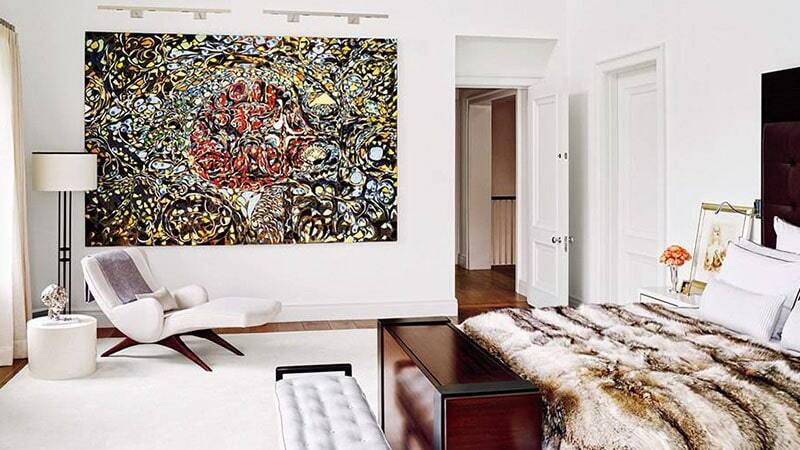 To take the look a step further, invest in matching pieces of artwork as well. 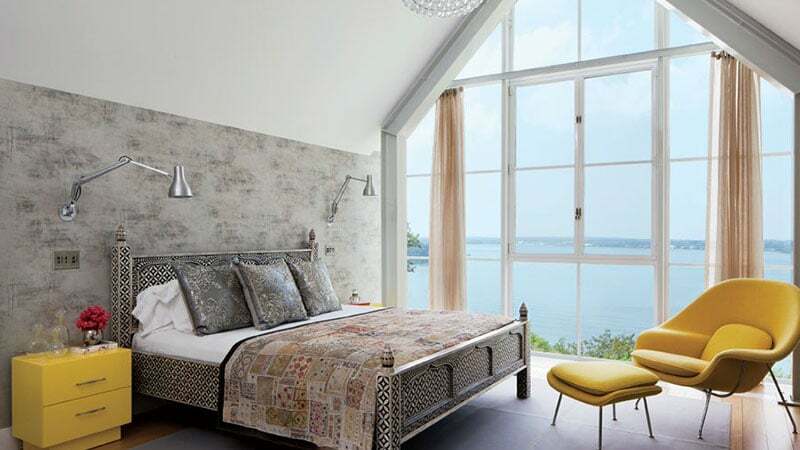 The addition of textural fabrics will help to create a homely and comfortable feeling in bedrooms. A fur blanket or shag rug is all it takes to nail this style. When used in bedrooms, navy creates a rich and luxurious aesthetic. Its deep hue looks great on everything from walls and bedding to lamps and accessories. Add pops of colour to an otherwise neutral bedroom in the form of throw cushions and flowers. The small additions will add interest to the room without overwhelming it. 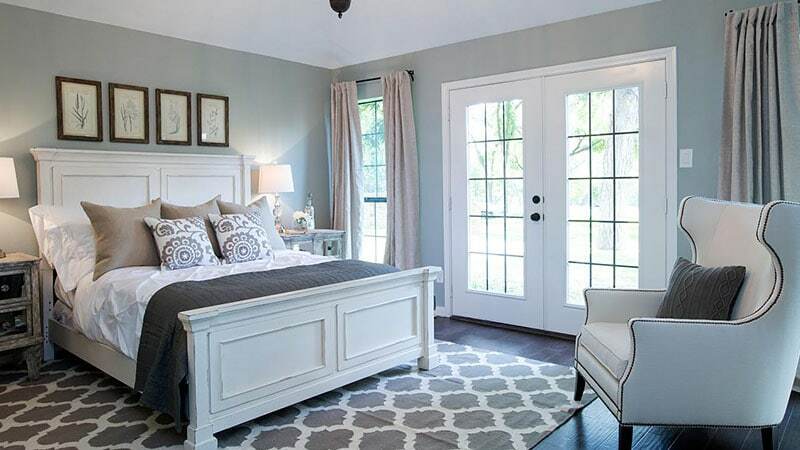 Simple, classic, and chic, this “country meets contemporary” style bedroom is a great example of interior design. While there are no bold pops of colour, this room adds interest in the form of the pattern on both the rug and throw cushions. The warm tones of this room combined with green plant life create the feeling of being on vacation right in your very own home. Infuse these elements into your own bedroom for a lovely place to escape and unwind. 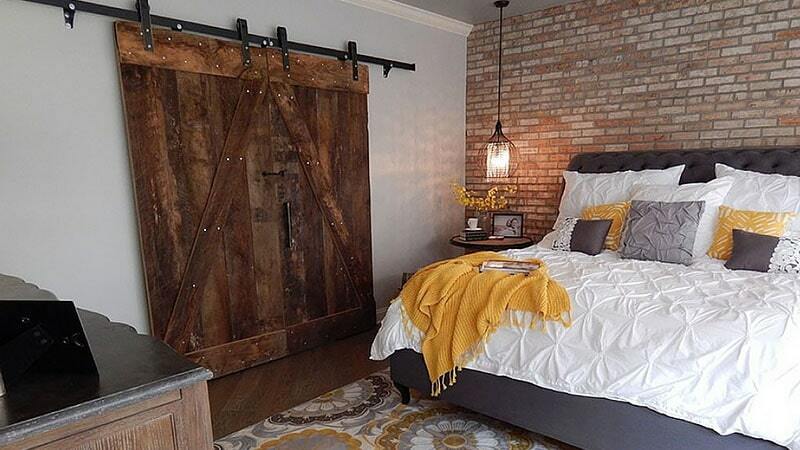 Let the addition of exposed brick and sliding barn doors add a strong, rustic touch to your bedroom. 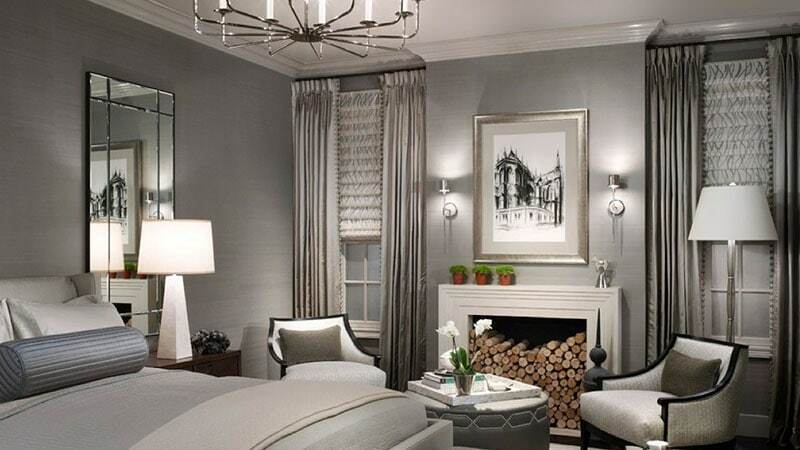 You can either mix it with contemporary pieces, such as in this bedroom or continue the theme throughout. Even the most basic room can be made to feel luxurious with the addition of rich textures and some greenery. 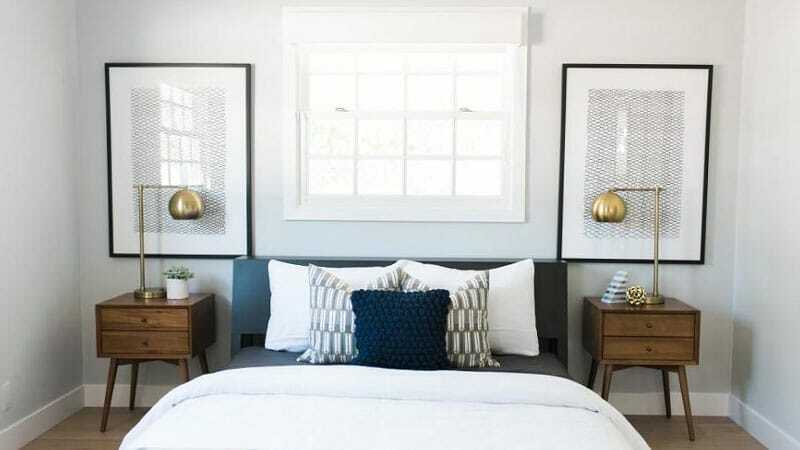 Instead of a single picture above your bed, opt for a cluster of similar frames and images for a contemporary look. Black and white is always a fantastic option and allows you to easily add colour in other areas of the room. 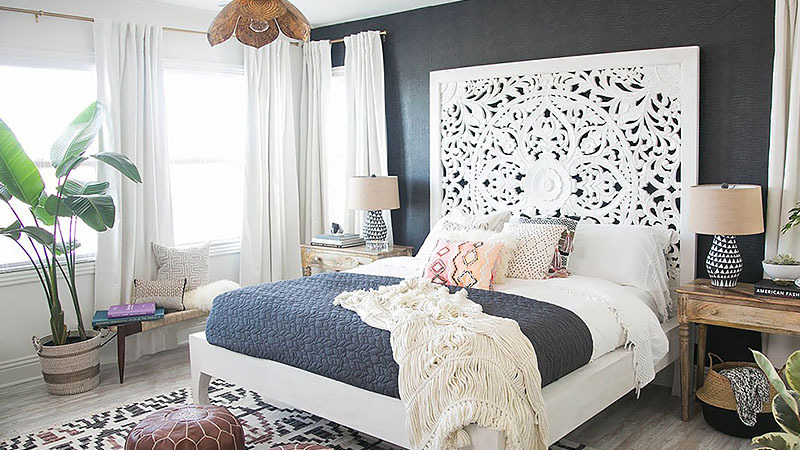 This chic bedroom relies on simple Moroccan touches to infuse it with undeniable style. By dressing up a plain white wall with a unique painting, you can create a wonderful, eye-catching feature. Just remember to keep the rest of your room rather simple when working with a complex piece. This bedroom features predominantly soft, warm tones that create a tranquil and homely feeling. The addition of some subtle, light blue pieces, however, infuse it with a refreshing quality that maintains balance. 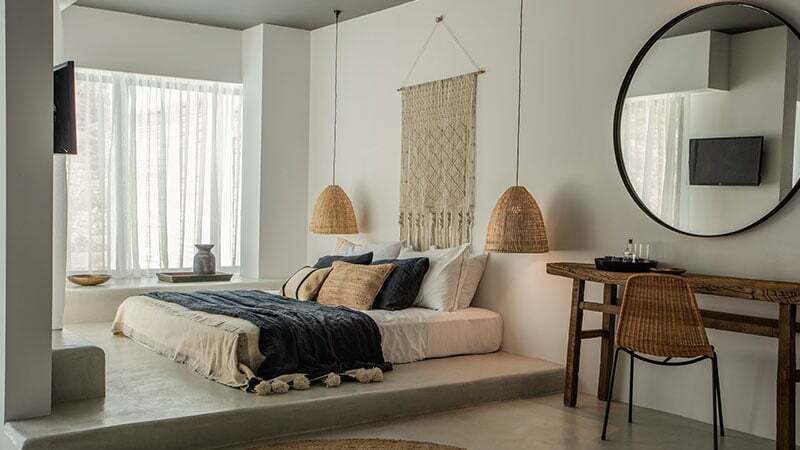 Everything about this room, from the headboard and bed to the plants and candles, creates the perfect bohemian oasis from the outside world. Add a few (or all) of these elements into your own bedroom for a romantic and creative atmosphere.